If you don't want to know what happens in the 4th season, or if you haven't watched 1-3 seasons, please do not read this post as it contains many spoilers! You can read my spoiler-free review here. There are three topics I could discuss for hours. My baby, vegan pasta and 'Grace and Frankie'. If you have been following me for a while, you definitely know that I am the biggest fan of this duo. When Netflix announced when they're back with new episodes, boy, I was never this excited for January! The fourth season is different. It did hit me at the beginning, and I have watched the first four episodes with a sad face on. I felt like this season was missing something. 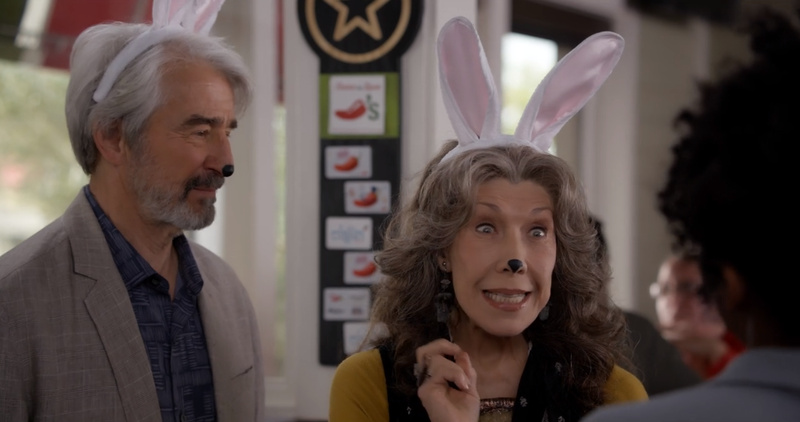 It was missing its witty jokes and the uplifting spirit that I love about 'Grace and Frankie' so much. It took me a good few episodes to acknowledge that it needed to be the way it is. It is a season of big changes and struggles, of painful reality and many endings. It is a reminder that ageing, and everything that comes with that, is a natural part of human life. But it's not all down in the dumps! Frankie and Grace don't give up easily and they made laugh a few times! Yes, ageing isn't easy, but these two women do it the right way. 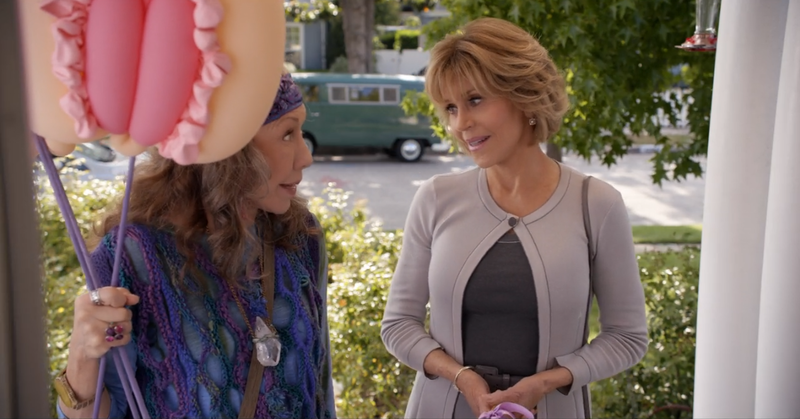 I genuinely value Jane Fonda and Lily Tomlin not only as great actresses but also amazing people. I love the chemistry between them. Life doesn't spare Sol (Sam Waterston) and Rob (Martin Sheen), and they also are going through a rough patch in the 4th season. Sol remains my favourite character of this show. He is such a warm soul. Hats off to an incredible actor, one and only Sam Waterston! Is it only me, or Brianna (June Diane Raphael) seems to be less cruel in this season? She is more human-like. God knows, is it because of the relationship she is in, or because she is facing a major problem at 'Say Grace'? The 'nicer' sister- Mallory (Brooklyn Decker) starts a life of a single mum of 4 (quite privileged, and stress-free, have to admit) after divorcing Mitch (Geoff Stults). Sol and Frankie become grandparents! Bud's (Baron Vaughn) daughter is finally born, she is adorable, and the labour scene was just fantastic! And Coyote (Ethan Embry). He is doing ok! I felt that there was not enough Coyote in this season, but at least we got to see the inside of his tiny house! With Grace going​ under a major​ knee surgery and Frankie being legally dead, this season is not as optimistic as the first three. Nonetheless, it is great. I hope that Netflix renews this series for the 5th season. And many more!